I am calling this night baking project as Spring Cupcakes project. 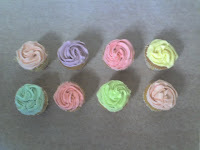 I decorated the cupcakes with pastel colored icing. 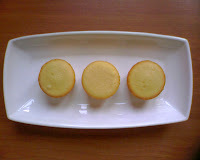 I tried two Vanilla Cupcakes recipes from two very famous bakeries in New York City for this project. They are Magnolia Bakery and Billy's Bakery. I have never been to these bakeries but always wanted to go. Maybe one day I get to. 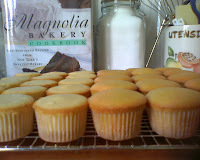 The first recipe I tried was the Magnolia Vanilla Cupcakes. 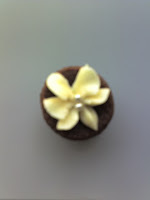 I have tried this recipe before by following those on Chokylit's site. This time I went out to buy the Self Raising Flour. 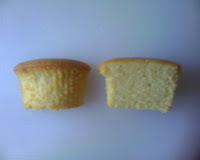 The results were the same delicious moist and semi dense vanilla cupcakes. Not so sweet and works well with butter icing. 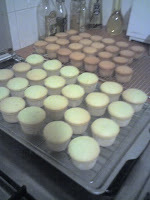 I scooped the batter 2/3 full into my Size 2 (My Mini) and Size 8(My Standard Size) cupcake papers; and I got consistent results of equal amount of cupcakes for each size. The second recipe I tried was from Billy Reece of Billy's Bakery. I searched the website for his recipe and found first, on Recipezaar and then later a video of him making these cupcakes on Martha Stewart Show. It was wonderful to watch the show. 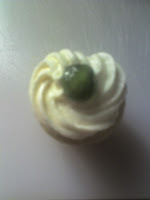 I posted my experience making Billy's cupcake in the previous blog but will post his recipe again in this one. 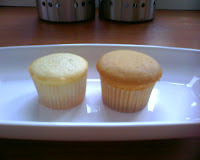 I scooped the batter 2/3 full into my Size 2 (My Mini) and Size 8(My Standard Size) cupcake papers; and I consistent results of equal amount of cupcakes for each size. But , in total makes slightly less cupcakes than Magnolias. 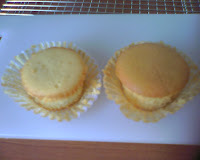 My Pick: It's hard to pick as the ingredients are almost similar, only different was the method of making the cupcakes. On first try, there is only slight, very slight difference in taste. After tasting the cupcakes; hot from the oven and cooled to room temperature; I pick Billy's Vanilla Vannila for the taste and the texture. 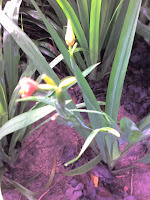 Here are the recipes and some photos. 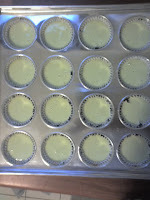 Line cup cakes/muffin tin with cupcake papers. Preheat the oven to 175 C/350 F. Cream the butter for a couple of minutes alone first, just to make sure it's adequately soft. Add the sugar in three additions, beating well after each addition. Add the eggs, one by one, again beating well after each one has been added. Mix the two types of flour together. Then add the flour in four additions, alternating with the milk and vanilla extract in three additions. 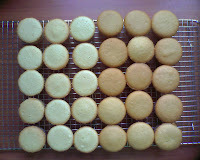 Divide the batter between the 12 waiting muffins cups, then bake for 20-25 minutes. Leave to cool completely, before frosting. Sift confectioners sugar. Beat butter till soft. Mix in 4 cups of confectioners sugar, vanilla and milk till mixture is smooth. Add in sugar till you get the consistency that you want. Preheat oven to 325°. Line cupcake pans with paper liners; set aside. In the bowl of an electric mixer fitted with the paddle attachment, combine flours, sugar, baking powder, and salt; mix on low speed until combined. Add butter, mixing until just coated with flour. In a large glass measuring cup, whisk together eggs, milk, and vanilla. With mixer on medium speed, add wet ingredients in 3 parts, scraping down sides of bowl before each addition; beat until ingredients are incorporated but do not overbeat. Divide batter evenly among liners, filling about two-thirds full. 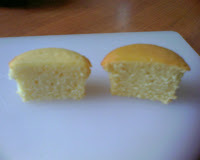 Bake, rotating pan halfway through, until a cake tester inserted in the center comes out clean, 17 to 20 minutes. Transfer to a wire rack to cool completely. Repeat process with remaining batter. 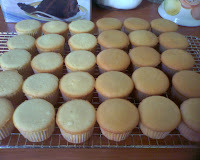 Once cupcakes have cooled, use a small offset spatula to frost tops of each cupcake. Decorate with sprinkles, if desired. Serve at room temperature. 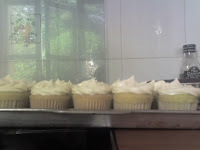 This is Billy Reece's of Billy's Bakery Vanilla Cupcakes recipe that I got from RecipeZaar and also Martha Stewart Living website. 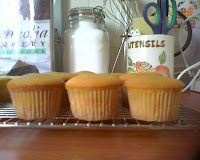 It produces nice, dense and moist cupcakes with a slight, just slightly round top. I filled the paper cups as per per recipe ie. 2/3 cups fulled. 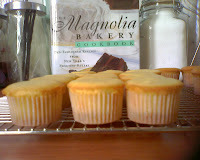 I made this same day as I made the Magnolia Traditional Vanilla Cupcakes so that I can compare the two. When I read the instructions, I thought, hmm is this a cake or pastry recipe? Billy uses a combining method called "One Bowl Method". Billy's recipe uses cake flour. I never really like cake that uses cake flour as it always turns out tasting like our Asian paus. However, it also calls for two different flours to be mixed together. Cake and the All Purpose flour. 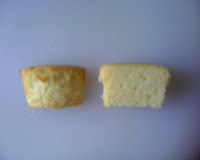 The results of mixing the two flours together produces what I think is the one of the best Vanilla Cupcakes I have tried! :)I frosted mine in multicolored pastel. Martha said Billy's icing is known for its creamy non grainy buttercream. Ingredients wise, same as Magnolia's. Note: If you go to Martha Stewart site for Billy's recipe, you will see that it stated 1 Tablespoon of Baking Powder. In the video, Billy's says 2 Tablespoons. So it really is a typo. I followed Billy's Vanilla Vanilla Cupcakes recipe on Recipezaar which ingredients and instructions is as per Billy's instruction in the Martha Stewart show. 2 Tablespoons of Baking Powder. I love, love this recipe. Another one from Elinor Klivans. It produces light, moist delicious vanilla cupcakes. It is quicker to make than the other recipes. So if you are pressed for time, this is the one to use. If you prefer the taste of butter, melt butter, then cool it before mixing to the batter. If you are using oil, I recommend canola oil. Sift flour, baking powder, baking soda and salt. Set aside. Place the eggs and sugar in electric mixture and beat till cream in colour. Stop the mixture and scrap the side of the bowl. On low speed, beat in the oil or melted butter. Beat till well combined. Mix in vanilla till combined. Mix in buttermilk till it is well combined with the mixture. Fold in flour till mixture is smooth in texture. Bake until a skewer inserted into the middle of the cupcake comes out clean, about 20-25 minutes. Frost with Vanilla Buttercream icing/frosting. Sift confectioners sugar. Beat butter till soft. Mix in 2 cups of confectioners sugar, vanilla and milk till mixture is smooth. Add in sugar till you get the consistency that you want. I tried this recipe by Elinor Klivans during the weekend. The result was moist and sweet milk chocolatey cupcake. Although I prefer slightly richer less sweet chocolate cupcakes, these are nevertheless tasted good. 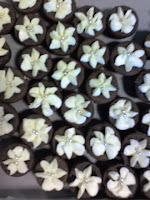 I frosted these with vanilla buttercream icing and sprinkled a couple of silver beads for decorations. 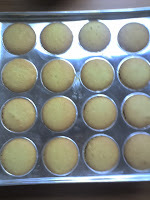 Preheat oven to 350 F. Line cupcake tin with cupcake liners. Put chocolate in bowl over the double boiler or a pot of simmering water and melt chocolate until it is melted and smooth. Set aside to cool slightly. Beat butter and sugar till creamy, the add the melted chocolate. Mix well. Then add egg one at a time, beating well after each addition. Mix in the vanilla and beat till the mixture is slightly lighter in colour. Mix in the sour cream till there are no streaks in the batter. Mix in the flour alternating with water, making sure that you mix them well. Scrape the sides of the bowl. Scoope or spoon batter into cupcake liners. 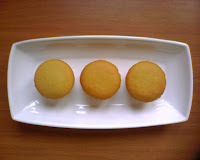 Bake for about 23-25 minutes or when a cake tester inserted into the cupcake comes out clean. Chokylit and Garrett have made their decisions and what an inspiration! Over sixty gorgeous and creative cupcakes from all around the world. Check out these recipes, blogs and creative creations from the Cupcake Roundup! Super cool. The first time I had a Red Velvet cupcake was one bought from The Hummingbird Bakery at Portobello, Notting Hill, London. I was in heaven (smile). The first time I made it, I forgot to put the vinegar-soda mix to the batter at the end. I was halfway through putting the batter in the paper liners. I panicked and decided to mix it in anyway - majority into the batter bowl and dropplets into the batter that I had already put in the paper liners. Disaster! The cake tasted like bitter guord ! 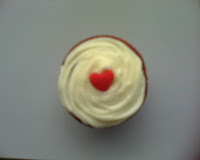 This time, I decided to try Sara Neumeier's Red Velvet cupcake because of positive reviews it received on Amazon. Then, I looked at other cupcake recipes and all of them used baking soda and vinegar. Then again, I read that those are not necessary because sour cream is acidic enough to give the cake the texture and body. But just to keep to the true nature of Red Velvet, I decided to experiment by using the good recipe from Sara and adding those ingredients that are not there. I adjusted a few things. Those in asterisks are the ones I added or adjusted. 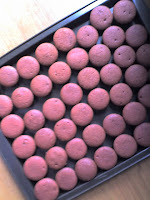 As for the red colour, I used Wilton Red tasteless red color paste. Overall, very happy with the end result. Preheat the oven to 350F. Line cupcake tins with baking papers. Sift together the flour, cocoa, baking soda, baking powder and salt. Set aside. In the bowl of an electric mixer, cream together the butter and sugar until fluffy and light. Add the vanilla. Add enough food coloring to turn the mixture to deep red; beat to combine. Add the eggs, one at a time, beating well after each addition. *Combine buttermilk, and vinegar, Whisk well together. Alternatively add flour mixture and buttermilk mixture, beginning and ending with the flour. Fill each baking paper two-third full. 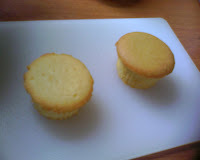 Bake until a skewer inserted into the middle of a cupcake comes out clean, about 20 minutes. 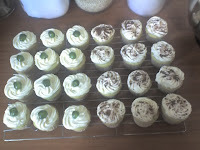 Let them cool completely before icing with Vanilla Cream Cheese Frosting and heart candy/fondant. Also good, with Vanilla Butter Icing. 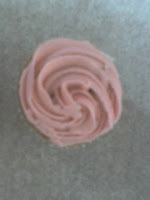 This is my 1st experiment to join in the Cupcake Round-Up! 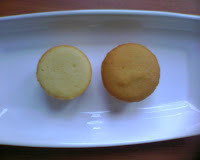 by Chokylit of Cupcake Bakeshop and Garret of Vanilla-Garlic due 26th Jan. 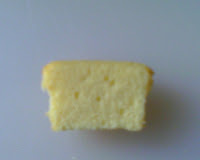 I adjusted a simple vanilla butter cake recipe to come out with this one. This recipe uses local ingredients that can easily be found in Asian countries. You can use fresh ingredients made from scratch or you can buy ready made ones from the groceries. I have used a mix of both. If you can have easy access to fresh coconuts; to get coconut milk, you need to get the flesh shredded and then mix with water, mix and press them, between your hands for couple of minutes so that the it will start to produce the milk. Put the mix into a fine strainer or a piece of muslin cloth. Milk it. Mixing and pressing one coconut, with one cup of water, will yield about 1 cup of thick coconut milk. 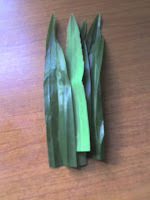 Likewise, you can get the pandan flavour by pounding pandan leaves using a mortar then slowly simmer it with coconut milk so that the fragrant and flavor will seap into the coconut milk. 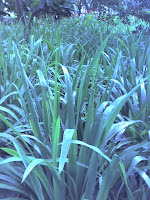 b) 1 1/2 teaspoon pandan essence mix with couple of drops of green food coloring. Preheat the oven to 350.F. Line cupcake tins with baking papers. 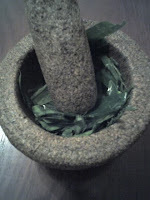 Slowly simmer about 3/4 to 2/3 cup of coconut milk with pandan leaves. You want 1/2 cup of coconut milk pandan. Set aside to cool. Alternatively, you can also just mix 1/2 cup of coconut milk with the suitituition described above. 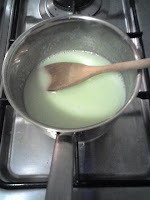 Place the eggs and sugar in electric mixture and beat till cream in colour. Stop the mixture and scrap the side of the bowl. On low speed, beat in the oil or melted butter and pandan mix. Beat till well combined. Pour in coconut milk/pandan mix and mix till it is well combined with the mixture. Fold in flour. 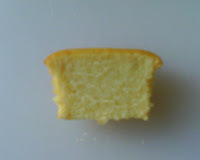 Bake until a skewer inserted into the middle of the cupcake comes out clean, about 20-25 minutes. Frost with Coconut Milk Buttercream frosting. Place butter, 2 cups icing sugar, ½ cup of milk and the vanilla extract in a free-standing mixer (or you can beat it by hand) and beat on medium-low speed. Add the rest of the icing sugar until you reach a desired consistency. Divide into separate bowls for your choice of colors. 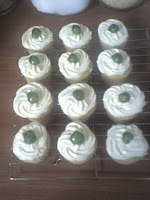 Decorate cupcake with frostingtopped with green cherries if that is your theme, or shredded chocolates or dessicated coconuts.